What better way to start a week than presenting a big check to a local children’s hospital. 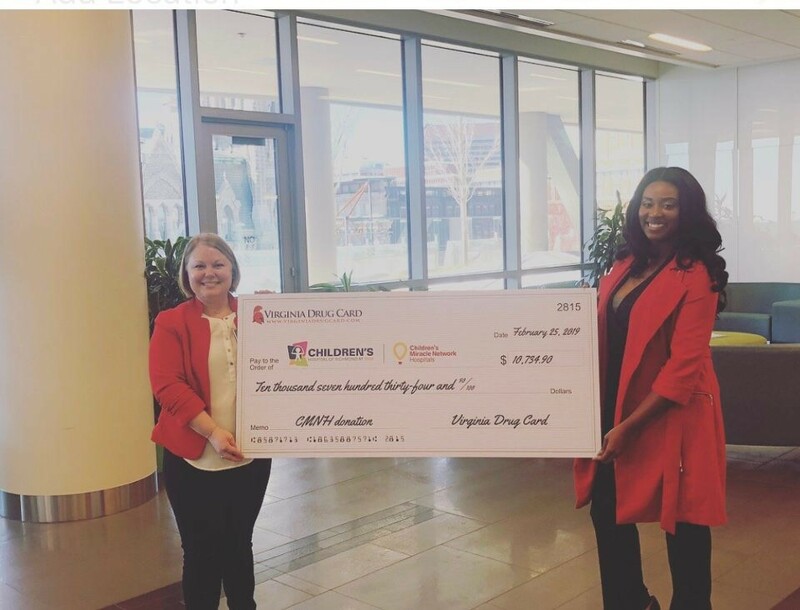 On Monday, February 25, 2019, Virginia Drug Card had the opportunity to visit Children’s Hospital of Richmond at VCU and present CMN director, Rachel Bruni, with a check for $10,734.90. Year round, Virginia Drug Card donates to local CMN hospitals each time the card is utilized at the pharmacy. Our donation dollars, in conjunction with many others, help provide not only medically necessary equipment and supplies but also helps provide amenities like libraries and activity centers for patients and their families. Get involved by sharing the Virginia Drug Card with your loved ones! Since 2015, the United Networks of America partnership with Children’s Miracle Network Hospitals has raised over $2.4 million dollars for local children’s hospitals. Of this, $10,734.905 has been raised for Children’s Hospital of Richmond at VCU. Next post: Celebrating $48,259 raised by Panda Express!